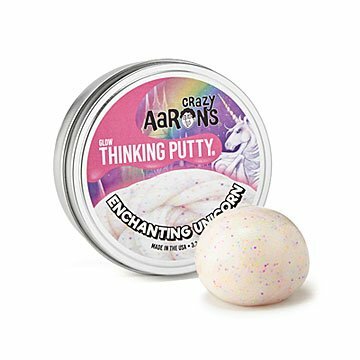 Hold magic in your hands with this unicorn-inspired rainbow putty. It even glows pink in the dark. Try as they may, scientists have yet to capture a unicorn. However, after much experimentation, they have created a substance that mimics the enchanted animal's best qualities. It's a squishy, sparkly putty that lets you hold magic in your hands. Like the majestic beast it's named for, the putty is strong, nimble, and smile-inducing. It's also filled with rainbow confetti and glows pink in the dark. Unlike an actual unicorn, this stretchy stuff comes in a handy storage tin. Made in Pennsylvania. I like the quality of the product.